warm until they germinate - for example in a propagator or in your airing cupboard. just pressing the seeds in lightly. Keep the seeds moist until germination. A nice white celery. The upright plants are vigorous, and grow on well, needing little or no earthing up to give a nicely blanched & mild-tasting interior. 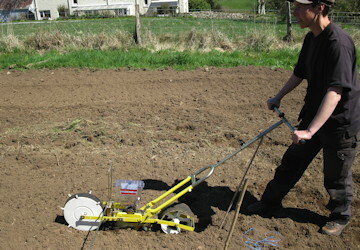 We are always very busy in the gardens, and so we like to grow crops that need the minimum of work to get a good result. So we were very pleased to find this self-blanching variety of celery which really is tender and mild without any attention at all. The one Ben is holding in the picture was not earthed up at all, though we tied it loosely with a bit of hessian twine towards the end, and we think that it has come out really well for so little work! 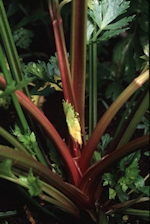 Some people like to pack straw around the plants to enhance the self-blanching effect further. Stands well, ready from October. This variety is actually an Italian strain, but we have found that it does well in the UK. Combining the best qualities of both parents, it has dark red stalks with emerald green leaves, and an excellent flavour. Deep red stems, big hardy plants. Bred by Frank Morton and released as Open-source Seed. Cutting celery is the same plant as normal celery, but bred for lots of leaf production rather than thick stems. 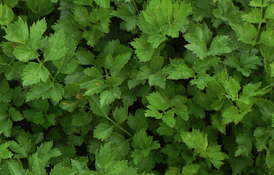 It is an easily grown and very useful garden herb, as you can just cut a few leaves when cooking. This is a special strain chosen for dark leaves and a particularly rich flavour. This is the well-known heirloom variety from Prague in what is now the Czech Republic, which has been grown for years in the UK with good results. We have a strain of seed that has been reselected in modern times for root balls that are a bit smoother. 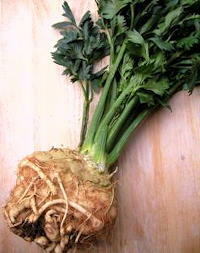 To get the best results from celeriac, water in dry periods and pull away the lower ageing leaves as the plant matures. A weekly liquid feed with homemade comfrey 'tea' or liquid manure will also help get really good sized roots - though we rarely bother to do this and still get plenty of celeriac to eat! Selected for smoother and rounder roots, so they are easier to wash and require less trimming.